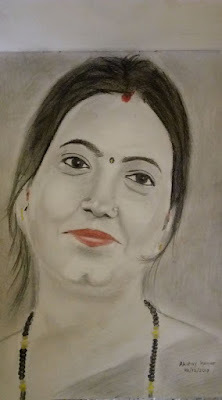 Pencil drawing artwork of a beautiful Indian woman, Smt Jyoti kumari from Bhagalpur, Bihar by Akshay Kumar. This pencil drawing portrait was made as a birthday gift to Jyoti kumari. As usual I started drawing with the nose and proceeded further. Then taking proportions I draw eyes and lips. Then outlining the face and shading it. HB pencil - HB pencil is used to draw the outline of female face in this drawing and also for shading the woman's face. 6B pencil -This was used for the darker shades in this drawing like hair. Colour pencils - Black colour pencil was used to draw the darkest shades in this drawing. Red color pencil was used to draw the realistic shining lips. Cotton - Cotton was used to blend and spread graphite so as to make the shading more uniform. Not to be confused with the Big Boss contestant Jyoti Kumari who is from Masaurhi, Bihar and was a commoner contestant in big boss 2017. Then Who is Jyoti Kumari ? This Jyoti kumari is from Bhagalpur, Bihar. Jyoti Studied Ph.d at TMBU, Tilka Manjhi Bhagalpur University, Bhagalpur and is in the field of education.